Top: Peter McCurrie’s name on Frizington War Memorial, Cumbria. Private Peter McCurrie, with family connections in Cleator Moor, Frizington and Stoke-on-Trent served throughout the Second World War and was released to the reserve in 1946. He was recalled to the colours in 1950 for the Korean War. This time he was not so lucky and he made the ultimate sacrifice, losing his life on 21 February 1951. He was 32 years old. Such are the fortunes of war. Peter McCurrie was the son of Mr and Mrs Thomas Currie of 33 Birks Road, Cleator Moor, Cumberland. The family surname seems to have sometimes been written as McCurrie and sometimes as Currie. In this article McCurrie will be used hereafter. The following information is based on details supplied by the KORBR & Border Regiment Museum, Carlisle, ‘The Whitehaven News’ and the Cumbria Archives Service (Whitehaven Records Office). 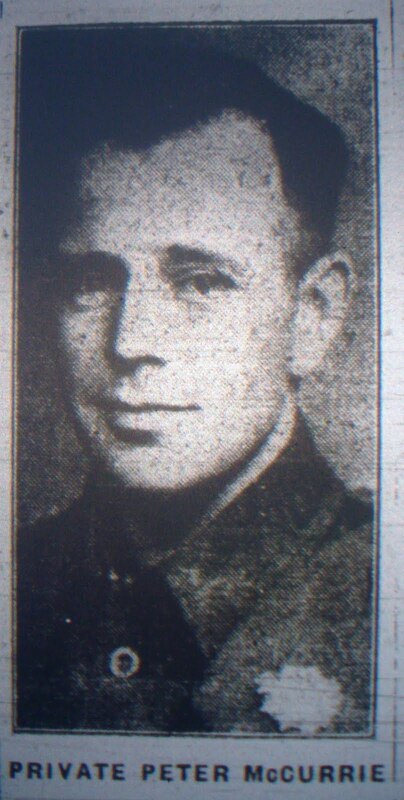 During WW2, West Cumbrian soldier Private Peter McCurrie served with the colours for seven years. He enlisted as a regular with the Border Regiment shortly before the outbreak of WW2 on 6 March 1939. His Service Number was 3599032. Early in the war he went to France as part of the B.E.F. with the Border Regiment. After the German breakthrough on the Western Front in May 1940 Pte McCurrie was one of the last to be evacuated from the Dunkirk beachhead. Shortly afterwards, Pte McCurrie volunteered for a Commando Brigade and subsequently took part in much fighting in North Africa and Europe. It was reported that Peter believed he had a guardian angel that looked after him, even though in North Africa he was wounded by mortar fire. Because of the operational nature Commandos were involved in very few of them remained unscathed. Nevertheless, if after a Commando raid during WW2 only two men were going to walk back alive one of them was going to be Private McCurrie. At the end of the war Pte McCurrie was discharged to the reserves on 2 June 1946. However by August 1950 - by then married with one young son and working as a miner in Stoke-on-Trent, Staffordshire - Peter McCurrie was recalled to the colours because of the Korean War and joined the Royal Ulster Rifles. Having survived seven years in Hitler’s war, this time Peter McCurrie had the misfortune of being captured by Chinese forces in the vicinity of Seoul, Korea on 4 January 1951. Another fellow West Cumbrian, Lance Corporal Robert Evans of Howgill Street, Whitehaven, Cumberland was captured at the same time and was announced by the Chinese "Daily Worker". Later on it was announced that Peter McCurrie had died. 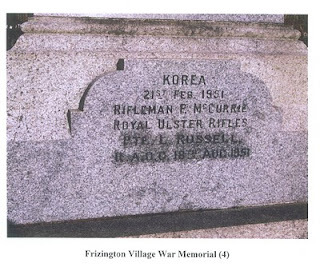 His name was eventually inscribed on Frizington village War Memorial - one of two casualties from the area to die in the Korean War (listed as Rifleman P. McCurrie). The other Korean War casualty inscribed on Frizington War Memorial was Private Leslie Russell, R.A.O.C, who died on 18 August 1951. These two casualties are commemorated each Remembrance Sunday along with those from the area who lost their lives during the First and Second World Wars.